Now I'm guessing this is a temporary tattoo as I've never seen a glitter ink'd gun tattoo before, but I could be wrong. Temporary or real, this is fabulous! Serena, that is one gorgeous tat... wouldn't that be fun for a real party or a romance novel party. 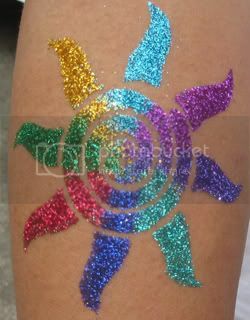 Glitter tattoos would be cool at Devon's coming out ball-party... maybe, even representing which wolf family pack you belong to... hmmmm... or something more fun.